"There is no end of makeup...neither there is the end of new launches. 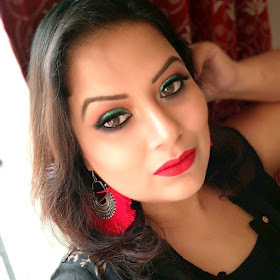 When the whole world just sits back and relax thinking Lakme has done it's the best part by launching "the Sabyasachi collection of makeup" (from which I reviewed the eyeshadow palette here) Lakme launched another range of 10 new MATTE LIP CRAYONS at an affordable price." Price: - Rs.185/- for 2.2gm of the product. It comes up with a dual sharpener. Lakme is India's No.1 color cosmetics brand offering a wide range of high-end, world-class color cosmetics and skincare products. Lakme has a vast product range specially crafted by experts for the Indian skin. The brand has also been redefining fashion in India with Lakme Fashion Week, India's premier fashion event. The Lakme Enrich Lip Crayon is a newly formulated lip color crayon, for a soft texture and smooth matte finish. Get soft and colorful lips every day, in 10 different shades of your choice. The Lakme Enrich Lip Crayons contain a high level of mineral powders, giving your lips a soft matte finish. It also contains a rich mixture of olive oil and jojoba oil which condition your lips. Sketch your lips, and make them your canvas with the new Lakme Enrich Lip Crayons.Now get a sharpener free with every purchase of the Lakme Enrich Lip Crayons! The matte lip crayons come in a crayon like the packaging. The outer body of the crayon is matched with the same color of shade it has inside. The crayons come with a dual sharpener. As the price range is so affordable that I grab all the 10 shades from this range. Each lip crayons comes with a dual sharpener (for which I have 10 dual sharpeners, that's a pretty lot). 01 BERRY RED- A perfect red shade. It will suit every skin tone. 02 RED STOP- A tomato red shade with a slight orange undertone. It will suit every skin tone. 03 CANDID CORAL- A neon coral shade. It will suit fair skin tone mostly. 04 MAUVE MAGIC- a bright magenta pink. It will suit every skin tone. 05 PEACH MAGNET- A neutral peach shade. It will suit fair skin tone mostly. 06 PINK BURST - A bright pink shade. It will suit fair to medium skin tone beauties. 07 SHOCKING PINK- A muted pink shade. it will suit fair to medium skin tone mostly. 08 BABY PINK- A neutral pink shade with a subtle shimmer in it. It will suit fair skin tone mostly. 09 CINNAMON BROWN- a neutral brown shade, the only brown shade in this entire range. It will suit fair to medium skin tone mostly. 10 BLUSHING PINK- An orange- coral kind of shade. It will suit fair skin tone mostly. It is actually 2/3 shade lighter than 02 RED STOP shade. The matte lip crayons come in 10 beautiful shades. The crayon is 2.2gm which means these are so small that you can carry it anywhere easily. The shade range has some red, pink, orange, coral, brown which are pretty dupeable ones. The texture of the lip crayons is matte. They glide smoothly on lips. The pigmentation of lip crayons are medium pigmented which can be buildable by swiping the lip crayon little more than usual. The lip crayons have semi-matte feels on lips that hardly survive on small snacks or drinks as all transfer a bit. The only drawback that I feel is the light shades of lip crayons in this range might not show up as much like the darker one on a pigmented lips. Overall, Lakme enrich Matte lip crayons are the most affordable lip crayon right now among all drugstore brand as these lip crayons are semi -matte in texture and pigmented enough to build up the shade color. Moreover, I always review makeup that is a little pocket pinch to college goers always but this lip crayon range is quite affordable for everyone I guess. So, if you want something pocket -friendly lip color then you can give this range a try. And yes here is a detailed video where I swatched all the 10 LAKME ENRICH MATTE LIP CRAYONS. Finally ending up with few FOTD pictures using these lip crayons.